Mallorca is steeped in history with roots that can be traced all the way back to the Neolithic Period. Numerous burial chambers have been discovered through the years. However, it wasn't until the Phoenicians that this island was colonized. 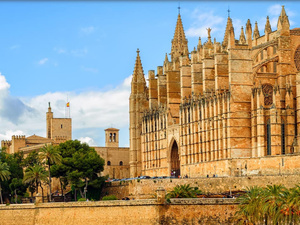 Throughout the centuries, Mallorca has been ruled, colonized, and captured by just about everyone from the Romans to the Byzantines all the way up to today where Mallorca is now the autonomous region of the Balearic Islands. 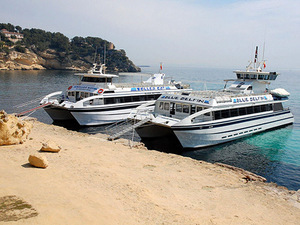 Air-conditioned and licensed round trip transportation from your Palma de Mallorca cruise pier! Entrance fee to Caves of Drach! Walking path at Caves of Drach! Boat ride inside the Caves and classical music concert! Visit the Majorica Pearl factory! Free time at Porto Cristo! 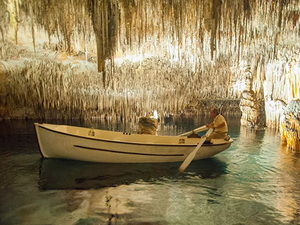 Come and discover the Caves of Drach, one of the top attractions in Mallorca. You'll also visit the Majorica Pearl Factory and have some free time at Porto Cristo to explore this natural harbor. 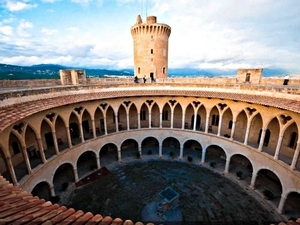 Round-trip route with on/off privileges in Palma de Mallorca! The option just to stay onboard for a city sightseeing loop! Multi-lingual audio narration on the bus - available in 8 languages! Escape the cruise ship shore excursion crowds and enjoy unique sights of Palma de Mallorca and surrounding area! 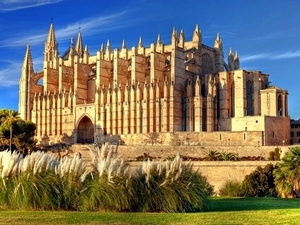 Be your own Palma de Mallorca excursion director and choose how and where to spend your day in Palma de Mallorca! Easy to use bus system to all the must-see locations with scenic views and local information on the way. Easy to use system map of Palma de Mallorca city! Multilingual audio narration on the bus - available in 8 languages! 18 Bus stops at the must-see sites! Touristic boat ride around Palma de Mallorca - available from 11:00 AM to 04:30 PM May to Oct! Drinks and snacks are served onboard the boat! 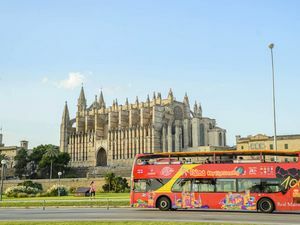 For a great way to see Mallorca, we offer the classic double decker bus with the hop on/hop off opportunity that lets you see this gorgeous, and historic city the way you want. Also included in this shore excursion is a Boat Tour that will take you around Palma Bay while you enjoy drinks and snacks. Round-trip, air-conditioned transportation from your Mallorca cruise ship terminal! Your private sightseeing guide and transportation! Multilingual professional shore excursion guides! Minimal amount of walking - only 300 yards! Cultural but entertaining private shore excursion, half day only! Your private half day discovery shore excursion of the main cultural points of Palma de Mallorca and the delightful village of Valldemossa, Spain! Round trip boat cruise from the meeting point! Coastal island shore sightseeing cruise by motorized catamaran boat! Two swimming stops at the southwest end of Palma! Buffet lunch with complimentary beverages! Enjoy the coastal highlights by boat and swim in the Mediterranean sea! See some of the city highlights on this Palma de Mallorca Excursion, swim in the Malgrats marine area and enjoy beach time afterwards. Photo stop at the viewpoint of Colomer! Free time at Formentor Beach! One-way boat ride to Port of Pollensa (only available from May - October)! Free time at Port of Pollensa! Visit a traditional village market! Discover the northern end of Mallorca on this full day excursion. Swim at Formentor Beach, enjoy a boat ride, have lunch at Port of Pollensa and discover the colors and flavors of the local markets. Be sure this would be a trip to remember! Round, panoramic bus ride to the Bellver Castle! 45- minute guided visit at the Castle! Like to explore on your own, but want the convenience of a guided Mallorca Excursion too? 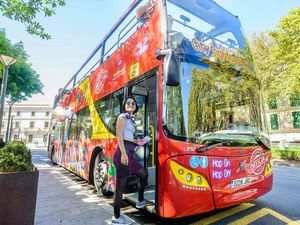 You can pick and choose which Mallorca City Sightseeing Bus stop is best for you, or ride the whole route and decide the next time around. As an added treat, there will also be a guided visit to the famous Bellver Castle, all included in the price and the pass is good for a full day! Private air conditioned, round trip transportation from your Mallorca cruise ship terminal! Multilingual and knowledgeable English speaking sightseeing cruise excursion guide! Free WiFi on board the transportation! Visit the highlights of Mallorca Island, Palma de Mallorca and Valldemossa! Entertaining and informative city and island sightseeing excursion! 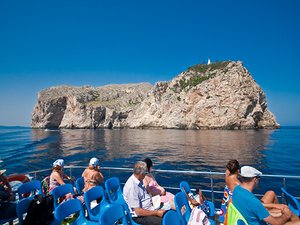 Enjoy a full day Mallorca sightseeing cruise excursion visiting the best historic sites and buildings of Mallorca Island. Palma de Mallorca and Valldemossa!